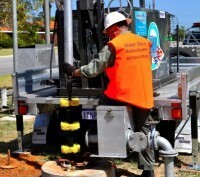 Water Bore Redevelopers is a market leader in the redevelopment of water bores throughout Western Australia. We have developed, in conjunction with Aquabiotics, the most advanced bore cleaning system in the world, to bring bores back to their original production capability, and in some cases, improve it. We are agents for Franklin Electric Pumps and are able to supply their complete range of motors, pumps and ancillary equipment. When a bore casing is particularly badly damaged, either through corrosion or some other means, the only cause of action in the past was to abandon the bore and drill a new one. 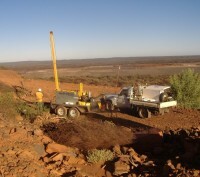 Now however we can re-line an entire bore saving on the cost of decommissioning the old one and drilling a new one. 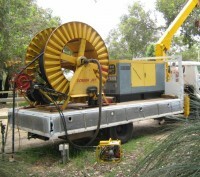 This re-lining can usually be completed in one day so can be a quick and cost effective way of resurrecting a bore. The ingression of fine sands into a bore can cause many problems, not least of which is excessive wear on the pump. This is usually caused by the screen apertures being too large in relation to the formation around the bore casing (possibly caused by corrosion).